Homepage. This page: Two competition-prepared Jaguar Mark 7s - 'LWK 343' and 'SUM 7' prepared for the Monte. Jaguar Mark 7s on the Monte. The two photos shown here are from my own collection, both show Mark 7 Jaguars prepared for the Rallye Monte Carlo, albeit it in different years. First up, a car that seems to have led an active competition life, both on the circuit, and in rallies. As the uprated MkVIIM wasn't introduced until 1954, the first car shown here, LWK 343, must be an earlier Mk7. The rally plate attached to the front bumper is dated 1952, the car number is 103. LWK 343 has been fitted with extra illumination, and the hubcaps have been removed. A slightly makeshift radiator blind has also been fitted, constructed from a handy piece of cardboard by the looks of it. The location of this photo is not known, the Esso and Austin signs in the background giving few clues. A hunt around for information, shows that this Jaguar was also competed - and won - at Silverstone in the same year (Production Car Race 1952), in the hands of Stirling Moss, and was used the following year to gain a speed record (121.704mph) at Jabbeke, in Belgium, in the hands of Jaguar test driver Norman Dewis. Moss again won in this car at Silverstone in 1953, and in 1955 Mike Hawthorne led home a trio of Mk7 Jaguars to win at Silverstone in this very car. The 1952 Monte was won by Sydney Allard and Guy Warburton, in an Allard P1, with a Sunbeam Talbot 90 coming second (Moss/Scannell/Cooper) and a Simca Sport rounding out the top three (Angelvin). But what happened to this particular Jaguar? is it still around, or likely as not did it disappear without trace? 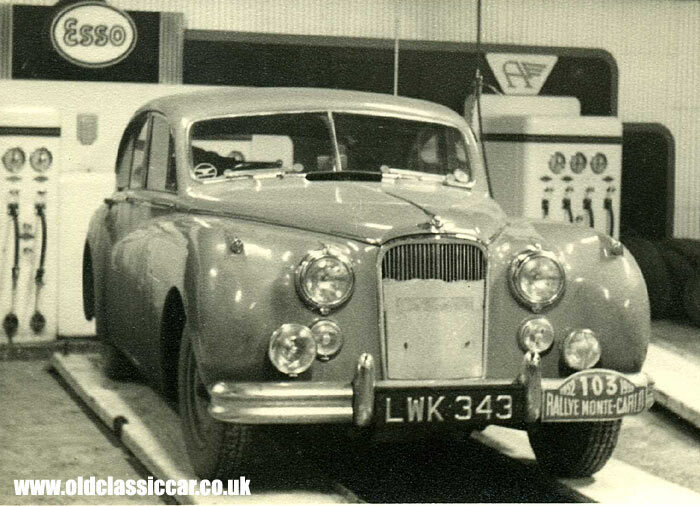 Less information seems to be available about the next Mk7, entered in the 1955 Monte Carlo rally, entrant number 90. 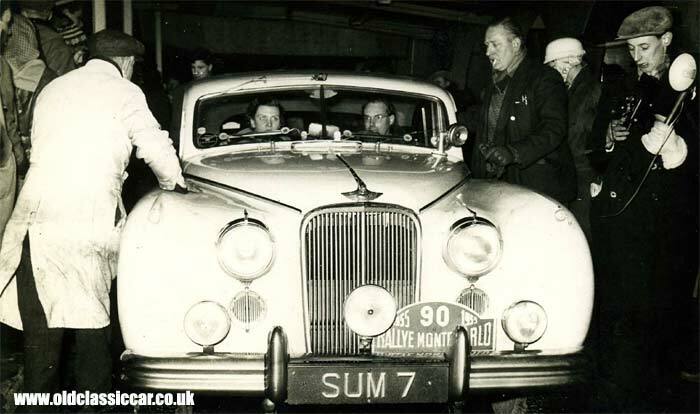 Perhaps the distinctive registration, SUM 7, will ring a bell with someone - does anyone recognise the crew in this car? Note the extra lamp fitted to the n/s/f scuttle area, the twin demisters fitted to both front screens with rubber suckers, and the chap from the Press to the right with his trusty camera. OVC 69, another once-famous racing Mk7, can be seen alongside a race-prepared 3.4 in the second photo to feature on the Jaguar Mk1 page. Of course most Mk7 Jaguars were built for road use, not competition, as this fine example of a MkVII Jaguar demonstrates. Return to Old Vehicle Photos Page 6.